Summers in the Honeoye Falls, NY area can be hot and humid, and that means that the people living and working there need air conditioning. High heat and humidity are uncomfortable conditions to deal with – no one wants to feel hot and sticky. When the temperatures outside are on the rise, people want to be able to turn on the air conditioner and get comfortable. If you’ve been thinking about installing air conditioning in your home, you may have a lot of questions, such as what is the best kind of air conditioning and if you can afford it. If you already have a system installed in your home, you might wonder how to properly maintain it, and who to contact if you need to have it repaired. John Betlem Heating & Cooling, Inc. can help. We provide reliable, professional air conditioning services throughout the Honeoye Falls, NY area, and we can assist you with your needs as well. No matter what air conditioning service you need – installation, repair or maintenance – you can count on John Betlem Heating & Cooling for all your home and business air conditioning needs. 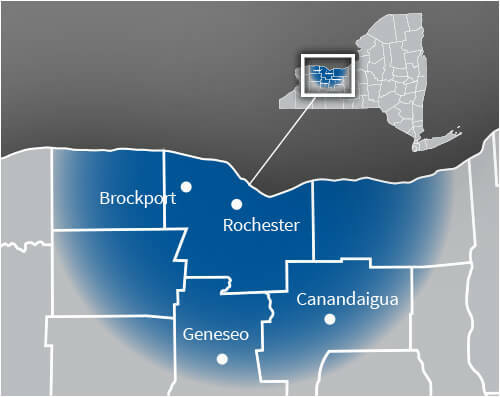 We’ve been helping people in the Honeoye Falls, NY area with their home cooling needs since 1941, and we think the reason for that is because we’ve always treated people with honesty and integrity. We’ll take the time to explain to you what exact services we will be providing for you up front – we don’t believe in surprising our customers with unexpected costs. Then, we provide you with top-level service and information, as well as the very best air conditioning system available. And you’ll never get left in a bind once we install your air conditioning – we service what we sell and work with you to make sure you’re happy with your air conditioning system now and for years to come. Count on John Betlem Heating & Cooling for the air conditioning needs of your Honeoye Falls, NY home. John Betlem employs a team of expert technicians who are specially trained to install quality air conditioning systems from the leading manufacturers, and can maintain and repair virtually any make or model of air conditioning system available. They’ll work hard to meet your needs in a professional and efficient manner, and to your complete satisfaction. Plus, we back everything we do with our exclusive written guarantee. We encourage you to compare our guarantee with the limitations, fine print and exclusions other companies tend to use to back their work, and see for yourself the John Betlem difference. This is why we keep growing, with more satisfied customers throughout the Honeoye Falls, NY area year after year. Enjoying better air conditioning in your Honeoye Falls, NY area home is as easy as making a call to John Betlem Heating & Cooling, Inc. We can help you get the air conditioning service you need so that you and your family can experience the best in home comfort. Simply give us a call at 585.271.8888 and we will be more than happy to help you with any HVAC service need you may have.